An hour’s drive from Montreal, a woodland plot overlooking Lac Grenier provides an idyllic setting for a site-sensitive home. Bound by a steep incline to the north and a stream to the south, Montreal based Paul Bernier Architecte positioned this new house lengthwise between the two, carefully preserving the natural features of the site. ‘We chose to create a low-profile, primarily single-storey building. Its meandering shape is determined by the opportunities offered by the surrounding landscape. The structure bends, opens, and narrows like a river carving its own path,’ says Bernier. Clad in vertical cedar slats of varying widths and thicknesses, the zigzagging volume has a minimalist appearance due to the installation’s concealed flashings and trims. ‘The surface reads instead like a palisade that follows the shape of the building and into which openings have been cut,’ explains Bernier. On approach to the house, the garage’s opaque treatment creates a notion of fortification, while a metal door signals the point of entry. The big reveal is reserved for the bright interior, where large glazed screens are orientated to exploit the spectacular views; the forest to the south and the lake to the east, with smaller picture frame windows offering sights and sounds of the stream to the north. 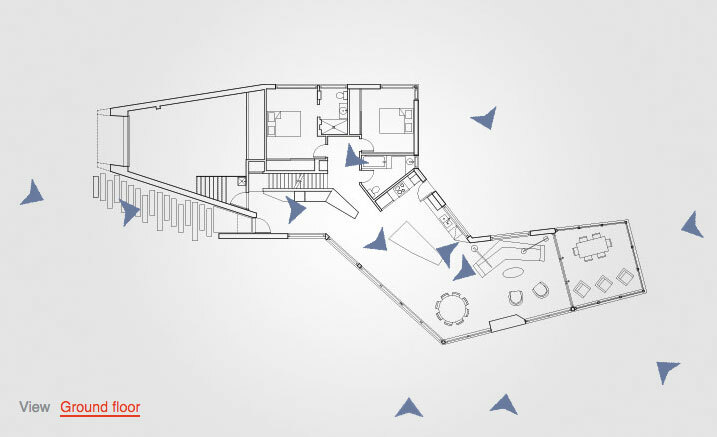 An internal pathway, suggested by the placement of three wooden masses along an axis, subtly divides the sequence of open plan kitchen, living and dining spaces, culminating in a cantilevered screened room. Fashioned from hickory, the abstract volumes, including an entrance cloakroom, a kitchen island and multimedia cabinet, contrast the refined palette of white walls and polished concrete floors with measured restraint, allowing the setting to take centre stage. The cloakroom unit screens the private areas of the house; the en-suite master bedroom, a second bedroom and bathroom. A hickory staircase leads to a tree-house style reading room, modestly positioned amidst the living roof. With time, the cedar will dull and planting will grow, rooting the house to the woodland as nature (and the clients) intended.